Enhance your machinery performance with good protection experience. Finbond Heavy Machinery Sdn Bhd understand the heart of all machinery owners to protect their machinery and their investment so that their machinery can have a longer life span and are always running at its best performance for a smooth working operation. To cater to these needs, Finbond Heavy Machinery Sdn Bhd is now the Sole Distributor in Malaysia for Turbo® Filtration, a trusted name for over 40 years in all engine precleaner for all types of heavy machinery. Turbo® Filtration is a USA manufacturer company that is based in Ohio which specializes in the designing and manufacturing of the engine precleaner for all types of heavy machinery used world-wide in construction, agricultural, mining, logging and many other industries. Why a Turbo® Precleaner for your machinery engine? Turbo® Precleaners offer the lowest restriction and highest efficiency of any precleaners on the market. • With the reduce of downtime, it also comes with the reduce of extra expenses on the maintenance and servicing. • Turbo® Filtration also helps the dangerous dust to filter out of the machine with its unique design, filtering it out safely before it can do any harm to your machine. 3. Contaminants are blown out special discharge ports by a high-velocity air powered rotor. 4. Only the purified air goes to the air filter. There is only one product on the market that is exclusively engineered to eliminate deadly micro-abrasive dust before it enters the filter – the Turbo® Precleaner! 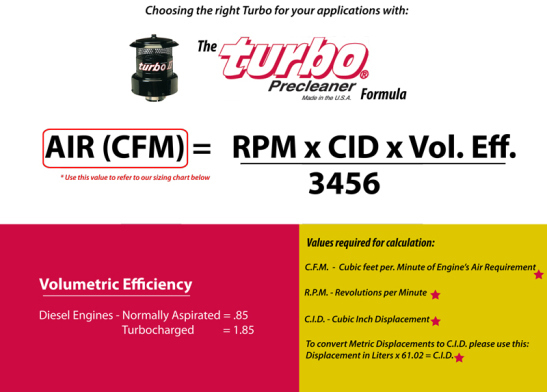 Determining which Turbo® Precleaner for your engine? Ask US! For more information and further technical information, do drop by at our yard or please contact us at our customer service number at +6012 323 3809, and we will be happy to send a representative over to assist you. Choose the right Turbo for your engine.